After scientists screened over 8,000 genes in fruit flies, only one, which hadn't been described before, triggered sleepiness. It's cold outside, you're sick and all you want to do is curl up under the covers until you feel better. In fact, the need for sleep can be so strong when we're sick that this may be all we can do. Scientists don't fully understand how this excessive sleepiness is different from your normal, everyday tiredness. Previous work in nematodes found a gene that dampens activity of wakefulness neurons in response to infection. Other research in mammals suggests elements of the immune response can influence behavior. Overall, scientists still have a lot to learn about what makes us feel sleepy, when we're healthy or sick. Some genes have been identified that seem to affect sleep, but none that actively induce sleepiness when turned on. But a study, published Thursday in the journal Science, finds one potential piece of the puzzle — in fruit flies. Scientists discovered a single protein that both puts flies to sleep when they're sick and also has antimicrobial properties. "This is a very interesting finding," says Dragana Rogulja, a sleep neurobiologist at Harvard who wasn't involved in the study. "It's pretty clear that infection or something that requires an immune response does lead to sleep, and this gene seems to do that." 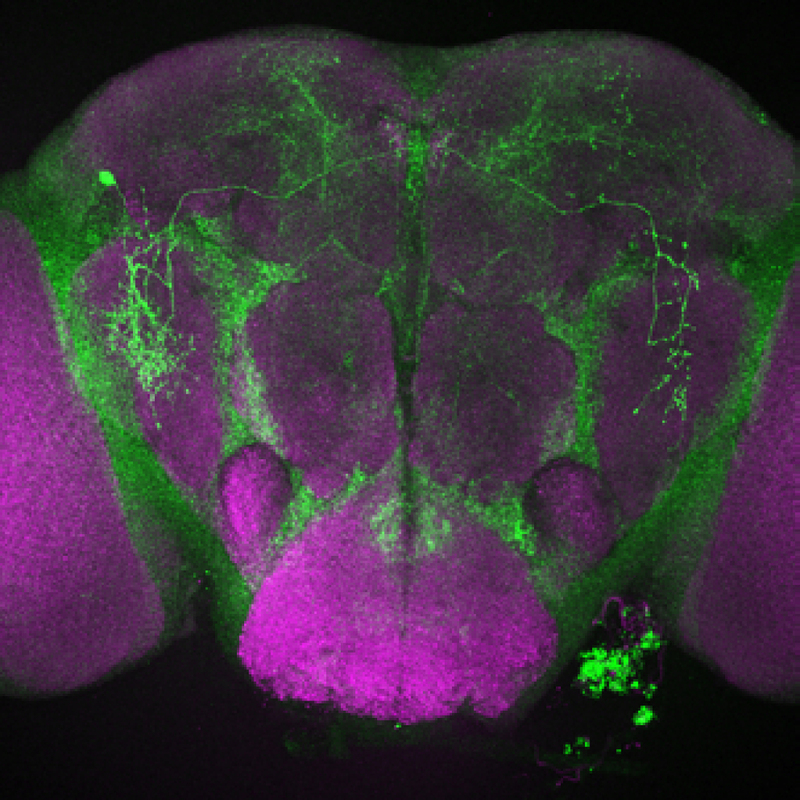 Expression of the nemuri gene (green) in neurons in the brain of a fruit fly. Neuroscientist Amita Sehgal led the study at the University of Pennsylvania's Perelman School of Medicine. She didn't set out to find a gene linked to both sleep and immunity. Instead, her lab was interested in understanding the molecular triggers of sleep. The first step of the work is conceptually straightforward: selectively ramp up the expression of random genes and see which ones induce sleepiness. Sehgal and her colleagues used lines of flies specially designed to allow researchers to overexpress a single, randomly selected gene. After screening over 8,000 genes, only one, which hadn't yet been described, triggered the flies to sleep more. The researchers named it nemuri, after the Japanese word for sleep. 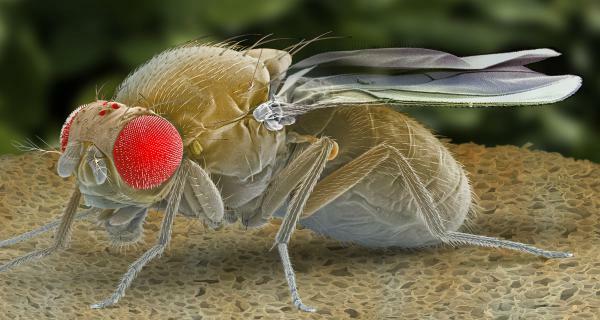 With a gene to target, the researchers took more detailed measures of the flies' slumber and found that it not only increased how much flies slept, but also how deeply. When exposed to shaking that wakes normal flies, most nemuri mutants hardly stirred. Intrigued, the researchers looked for other fly proteins with similar sequences to get a better sense of what this protein might be doing. But they couldn't find anything like it. "Then I noticed this protein had charged amino acids just like some antimicrobial proteins," says Sehgal. The researchers compared nemuri to other antimicrobial proteins and found a close match. "And it was in fish," recalls Sehgal. "We were extremely surprised," says Sehgal. "We thought it would be something that's more brain-centric rather than involved in the immune system." But then Sehgal thought of a connection. "We thought, wait, it makes perfect sense!" She recalled an experiment from the 1960s where researchers drew cerebrospinal fluid from sleep-deprived goats and found it put spry goats to sleep when injected. Experiments like this one suggested that there must be some substance that both builds up as an animal's need for sleep increases, and induces sleep. Scientists have struggled to pin down precisely which molecule in the cerebrospinal fluid triggers sleep, but Sehgal says some evidence has pointed to immune molecules. If nemuri has a dual role in promoting sleep and fighting infection, then Sehgal expected that the gene should turn on when a fly gets sick. She and her colleagues tinkered with the flies genomes to be able to see where, and under what conditions, nemuri is expressed. Sure enough, after infection distinct parts of the fly brain that control sleep lit up with nemuri activity, and the flies spent more time sleeping. Additionally, flies who were artificially sleep-deprived also showed extra nemuri expression. "This suggests sleep deprivation itself is a stressor, just like sickness," says Sehgal. And the best response to the stress of sickness or sleep deprivation is, of course, to sleep. That proved true for sick flies. Those who overexpressed nemuri were twice as likely to survive serious infection than controls. Nemuri flies also had lower bacterial loads, consistent with the protein's antimicrobial nature. Did this survival stem from nemuri itself actually fighting bacteria throughout the body? Or did the whole immune system just get a boost from more deep sleep? "Unfortunately this experiment can't distinguish between those two possibilities," says Sehgal, who plans to address this question in future work. So what is the purpose of nemuri? Is it only involved in stress-induced sleep? Or does it play a more central role in driving the need to sleep? "At this point the most we can say about this molecule is that it's really important under conditions of sickness or stress," says Sehgal. Nemuri isn't expressed much under normal circumstances, suggesting that it doesn't play a central role in sleep. This interpretation is bolstered by the observation that when the team disabled nemuri, the flies still slept fine under normal conditions, though not quite as deeply. Rogulja agrees that these results don't point to nemuri as a central player in driving sleepiness. "But, the researchers convincingly showed that it's important for this special case [of stress- induced sleep]." She says, "I can maybe imagine some cool system, a practical tool to induce sleep or clear infection." Sehgal is quick to point out the her team couldn't find a gene like nemuri in mammals, so the relevance of this work to humans remains to be explored. Still, she says that antimicrobial proteins abound in mammals, and many are known to interact with molecules that are linked with sleep regulation. "We've sort of been down this road before where, we've done something in flies and it's not immediately obvious whether it applies more broadly," says Sehgal, "but then it eventually turns out to be relevant to us too."